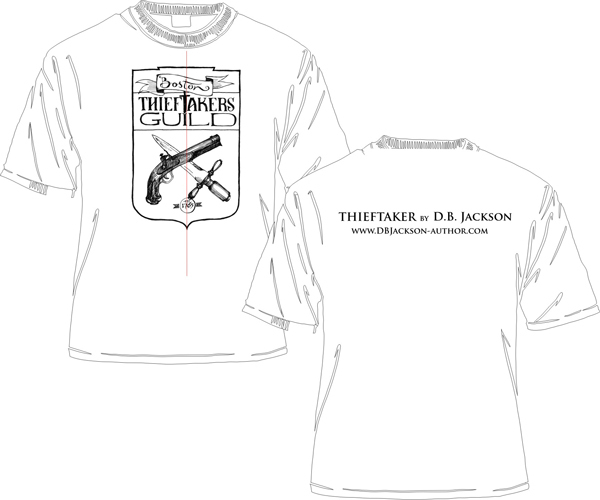 Check Out the THIEFTAKER T-Shirt! The design was done by a friend of mine. I wanted something that would look just like one of the old-time guild insignias — authentic, hand-drawn, but also official enough to be convincing — and he really came through for me. I don’t know yet what I will be selling them for — that will depend on what my final cost per shirt comes out to. I would think that for regular sizes the absolute maximum price will be $15 (2x and 3x sizes will be $2.00 more than the base price); I am hoping that I can go lower than that. My goal is to get people wearing them. So, do you like the design? Who wants one? Oh wow, this looks terrific!!! I don't suppose you'll have any advance copies of Thieftaker for sale at ConCarolinas, will you? It would be lovely to get 'em signed. I hear they'll make great gifts. ;) I'm guessing a whole month early is a bit much to ask for, though. I'm sorry, Amy. I won't have any copies of the book at CC. As you say, it's just a bit too early. T-shirts, though! Plenty of t-shirts. :) Thanks for your interest. I would like one. Hopefully you will have at ConCarolinas. Definitely hoping to have them at CC. I must say...very tempting. It will depend upon the cost. Thanks, Jagi. I'm hoping to keep that price down. Doing what I can.